I greet you in the name of our loving Lord Jesus Christ. 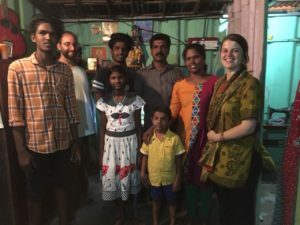 By God’s grace, with your prayers and support, we have been doing well and God has been providing opportunities to preach and share the gospel and also start various ministry outreaches in the slum, Santhom colony. We really thank you and appreciate all your prayers and we pray regularly for you and your family. Sandhwanam Orphanage: After more than a year, the founder Ms.Radha Menon, and the girls of the home, completely trust our family. One day six girls asked us to take them to church. We took Anuja (18), Sridevi(18), Jeffina (18), Anitha (16), Chinnu (18) , Nandini (14.) During fellowship meetings the girls pray for different heart issues. We have given them Bibles. Recently, one girl Raji got married and the founder of the orphanage requested we be “like” Brother and Sister for her. What a great honor to be given a position like this in our culture during marriage. From our ministry we could support $880 towards her marriage thanks to our wonderful donors through Grace Klein Community. We had a wonderful time. We still maintain contact with her and we would love to visit her and her husband in near future. Santhom Colony: We are thankful to The Lord for opening doors into Santhom Colony. The Lord has been so gracious. He has been guiding us and He has been protecting us, giving us wisdom and discernment to continue in this slum. The colony is suffering from many issues such as no homes, no toilets, some men are involved in crime, drug peddling, some women are involved in prostitution, some women send their teenage girls into prostitution, families struggle from financial debts, and many have no proper income on monthly basis, etc. Santhom colony is a slum where there are 105 houses and 150 people. From January 2018, we started focusing on this area. We conducted a basic survey from each family. We have been leading English and soft skills classes during the summer for the children. We play football games with the teens with our church teens. We have started women fellowship and when Ellie and Michael visited us, they could share the gospel and share of God as a Father. In women fellowship, there are six women who come regularly. We sing songs and encourage them to share their present life. Later we share the Word of God and we pray for one another. It has been so beautiful. We did help 40 year old Jomon financially ($450) for his testicular cancer from cancer charity and provided $300 assistance for his children’s education. Now we have access into relationships with four families. *names changed for privacy. Ram and Rajinis* family: Both work as driving trainers. They are Hindus, have visited Protestant churches in the past, but not anymore. They have two sons in the age of 15 and 19, Yedu and Nandhu. The family suffers from huge financial debts, which occurred due to some health issues. Both of the parents are very good at heart, but do not have wisdom to handle finances. They have been living by pleasing human beings. Sini has Bible, prays and reads it, but not able to obey anything from The Bible. We have been spending much time with this family in counseling and teaching through the scriptures. They have not yet been convicted in their sins nor turned to repentance. Brijitt and family: Brijit is in her 60’s, a widow and works as a house maid. She has a son (22) and daughter (18). Daughter is struggling and Brijitt is really worried about her. Son works as a mason in far city. Please keep this family in your prayer. Brijit is one of the 6 women who attends our regular women’s fellowship in the slum. Jomon’s family: Jomon has four kids. Jomon suffers from testicular cancer and not able to work. His wife Jency works as a house maid. Jomon and Jency are not doing well in their marriage. Through our cancer charity organization, we have decided to help three of their children with education. Please keep this family in your prayers. Devika’s family: In this family there are four teenage girls and one teenage boy. Father has passed away and mother works as a cleaning staff. Please keep this family in your prayers. Subodh’s family: Subodh is from North India and works in a helmet shop. I met him five months ago and he keeps coming to church every Sunday. I have been spending lot of time with him in teaching the Bible. I have been helping his children with their school admissions. He had a habit of chewing tobacco leaves, for the past 20 years, and for the past one week he quit this habit. We celebrate his successes with him. He lives in our city with his wife and two kids, one studying in second standard and another one in nursery. Please keep this family as well in your prayers. American friend’s visit: a couple from US visited us and stayed with us for a week. They have done amazing teaching among the orphan girls in two orphanages and taught English and Bible stories to the slum kids. They also have trained 35 Bible college students in exclusive church planting training. We had an awesome time and their presence was encouraging and inspiring for us. We have been given our church’s teen ministry and there are 25 kids. Some of them have accepted Jesus and been baptized after teaching basic doctrines and some of them are on the way. We have been visiting their families on alternative days and spending two –three hours to get know them and the teens. Pray that God gives wisdom and patience to handle the teens and help them to become leaders and disciples. Our desire is to help a couple of women in the Santhom colony to train in crochet work. We are working on logistics. 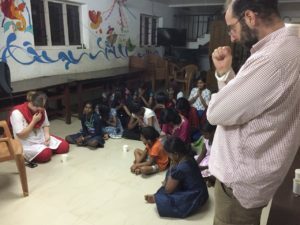 Women’s fellowship in the slum. Teen ministry in the slum and specifically, by year end, that we will see souls accepting the Lord as their personal Savior and giving their commitment to be His disciples in the Kingdom. Our family to be strong in The Lord and protected during our travel as it is monsoon season and not fun to drive a car or bike.